On this date in 1524, the first Reformation martyr of Switzerland was beheaded in Lucerne. Klaus Hottinger (English Wikipedia entry | German), a cobbler by trade, was among Zurich’s early radical reformers — the folks impatient enough for ecclesiastical change to go looking for provocative transgressions. 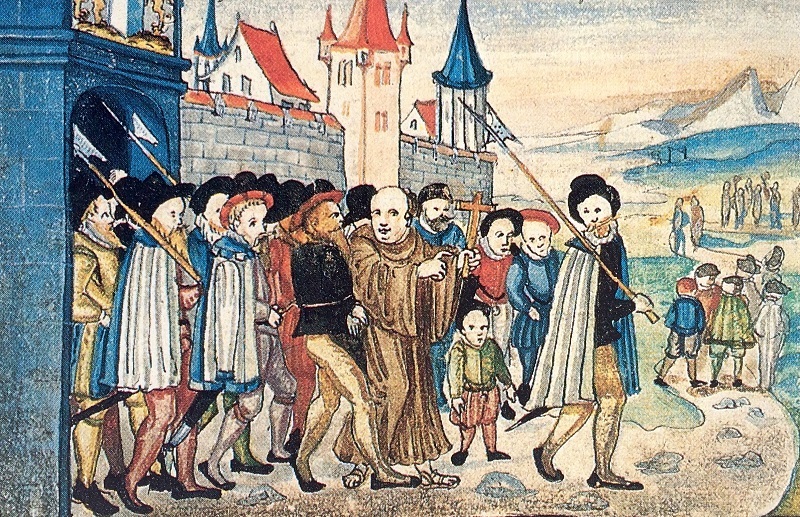 On March 9, 1522 — two years to the day before his martyrdom — Hottinger was among several Zurich denizens who calculatedly broke the Lenten fast by gobbling sausages at a printer‘s home. History charmingly designates this event “the Affair of the Sausages”. It was scandalous precisely because Zwingli, a pastor, made no attempt to enforce the Church’s fasting edict on his fellows, and then defended the carnivores. But still, Luther — strenuously at work in this period to dissociate his own cause from rebellion — would have his followers pick their battles. Does going out of your way to beef over the meat thing help or hinder the cause? There are some who are still weak in faith, who ought to be instructed, and who would gladly believe as we do. But their ignorance prevents them, and if this were faithfully preached to them, as it was to us, they would be one with us. Toward such well-meaning people we must assume an entirely different attitude from that which we assume toward the stubborn. We must bear patiently with them and not use our liberty, since it brings no peril or harm to body or soul, nay, rather is salutary, and we are doing our brothers and sisters a great service besides. But if we use our liberty without need, and deliberately cause offense to our neighbor, we drive away the very one who in time would come to our faith. Hottinger wasn’t the bearing patiently type. 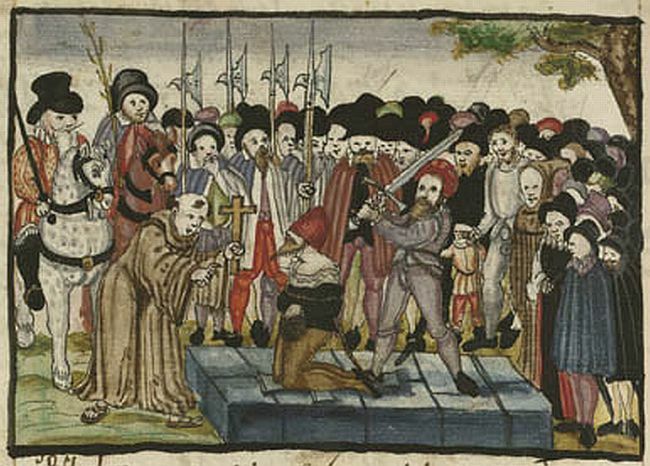 As if the sausages weren’t enough, our enragee ratcheted up the deliberate offense in 1523 with an iconoclastic strike against a roadside crucifix. This stunt got him exiled from Zurich and put his sacrilege show on the road. As it transpired, not every canton was as easygoing as Zurich.